The MedX cervical extension machine is an effective solution for patients who suffer from neck pain and/or headaches. Because the cervical muscles must continually support the weight of the head, headaches and neck pain are common clinical complaints. These ailments often result from muscular weakness or traumatic injury. The MedX cervical extension machine is highly reliable for cervical extension strength testing and dynamic variable resistance training. 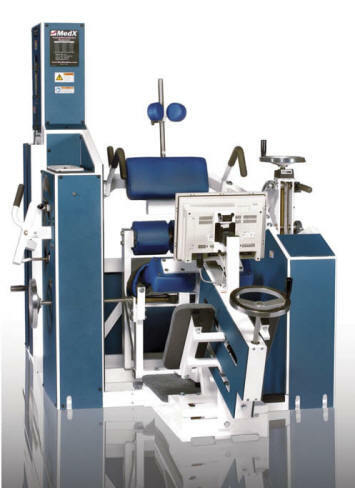 The MedX lumbar extension machine is recognized as the gold standard for treating and reducing chronic back pain and dysfunction through specific spinal strengthening. Weakness of the musculature of the spine can lead to many conditions, such as herniated discs, facet syndrome and degenerative joint disease. Research shows that specific spinal strengthening exercises using MedX helps people get better, even after multiple failed attempts at other forms of treatment.